This unforgettable tour takes you to a scenic boat cruise on Pai River to long neck village Ban Nam Piang Din. From Mae Hong Son town, turn right along the path to Tarad Mae Pong Daeng, Enjoy a pleasant drive through the mountains to Huai Dua about 14 kilometers before the bridge over the river and turn left along the river boat service name Ban Huay Dua. 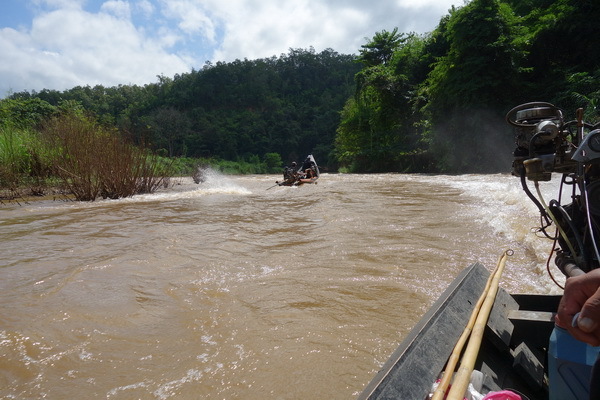 And take a boat about 1 hour cruising along Pai River to long neck village Ban Nam Piang Din. This promises to be both a major tourist attraction and an eye-opening experience, as you will be exposed to tribal poverty as well as the richness of their art and culture. Huay Pu Keng or Thai name Ban Nam Piang Din is the last point on this side of Thailand, with the Burmese border only 5 km away. During the civil war in Burma, all minorities was hunted down and killed for an on period of nearly 50 years. These people’s situation is as unclear. Running away from neighboring Burma at the end of the 20th century, they arrived in Thailand and got the political refugee statute, plus a piece of land to work and make a living. They don’t have Thai citizenship, neither the right to work in Thailand. The only income sources are tourists who come visit, attracted by the exotic long-neck women. In the village live the Padaung ( Long Necks ), a subgroup of the White Karen, as well as Langohr women, a tribe of the Red Karen. The Karen call themselves Kayan. Kayan Lahwi is the ethnic group whose women wear brass rings around their necks with the purpose of making them appear longer. The origin of this tradition is still under discussion. Some authors claim the women started wearing the brass rings so that the men in rival tribes would find them less desirable and thus uninterested in turning them into slaves. 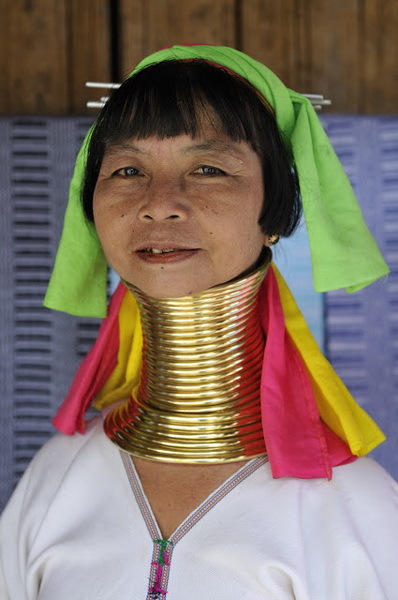 Others say that, on the contrary, a long neck is a sign of extreme femininity and thus the Kayan women become more attractive and desirable to their men. At Ban Nam Piang Din, you will find long-necked and long-eared girls. Handicrafts made by them are available. Price is not so expensive. 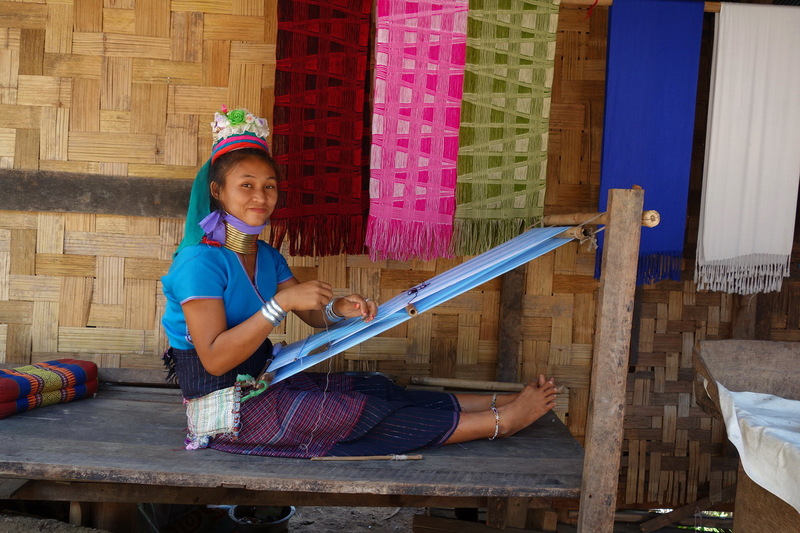 Long-necked Karen is a symbol of Mae Hong Son tourism. 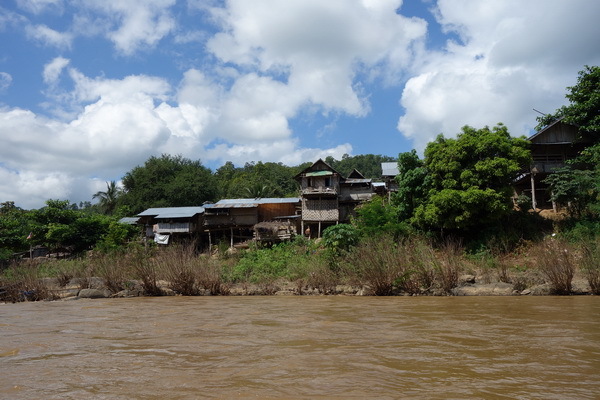 There are 3 major villages of long-necked in Mae Hong Son : Ban Huai Suea Thao, Ban Nai Soi and Ban Nam Phiang Din. Ban Nam Piang Din seems gain more popularity. Most tourists pay quick visits to the Kayan villages, take a few photos of the women and leave without getting to know anything about the Kayan people: why they are in Thailand, why they wear the rings, what remains of their traditional culture and beliefs, what are their hopes for the future? But, It is possible to stay the night in Huay Pu Keng in guest houses built by the residents of Huay Pu Keng. Within the village, visitors should remember that they are guests. It is a village, not a theme park and as such you should not leave litter or walk into peoples’ houses without invitation. Donations to the schools and gifts to the students or school are welcome, but please do not disturb classes in progress. In addition to cash donations, recommended gifts for the school and the children are: White board pens, permanent markers, toiletries (soap, toothpaste, washing powder), sports equipment, clothing, instant noodles (e.g. Ma-Ma noodles) and fruit. At present (2009) the school has enough exercise books, pens, pencils and colours, however other stationary items are still welcome. 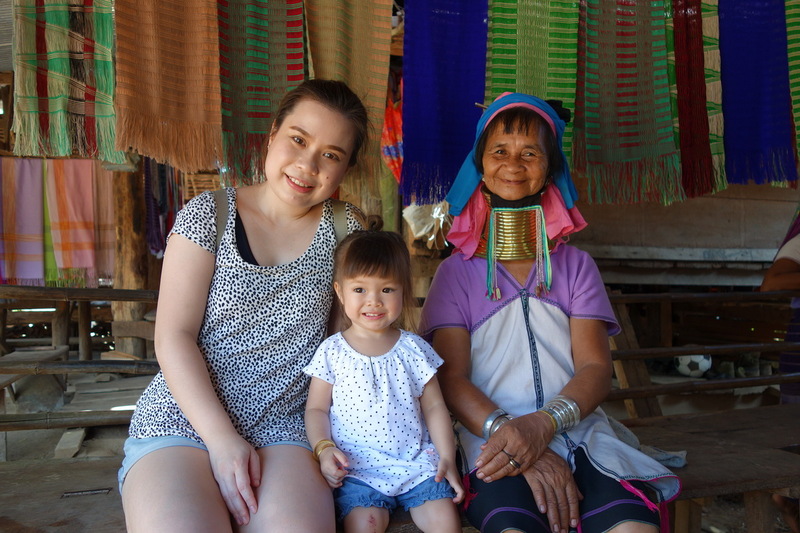 The people of Huay Pu Keng are used to visitors and many are happy to pose for photographs. Impromptu grabbing or touching any of the villagers is as rude as it is anywhere else.